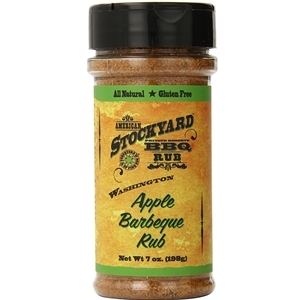 American Stockyard Washington Apple BBQ Rub is a sweet and savory blend of sugar and spices that has a sweet apple finish. This is the spice companion to our award winning Harvest Apple BBQ sauce. Create a sensation when you use it on pork, chicken, or ribs at your next barbeque. 7oz. Brown sugar, sugar, salt, spices including mustard, paprika, dehydrated onion, malic acid, natural flavor.